What do I mean by FOLK, you ask? The Festival of the Lion King, of course! 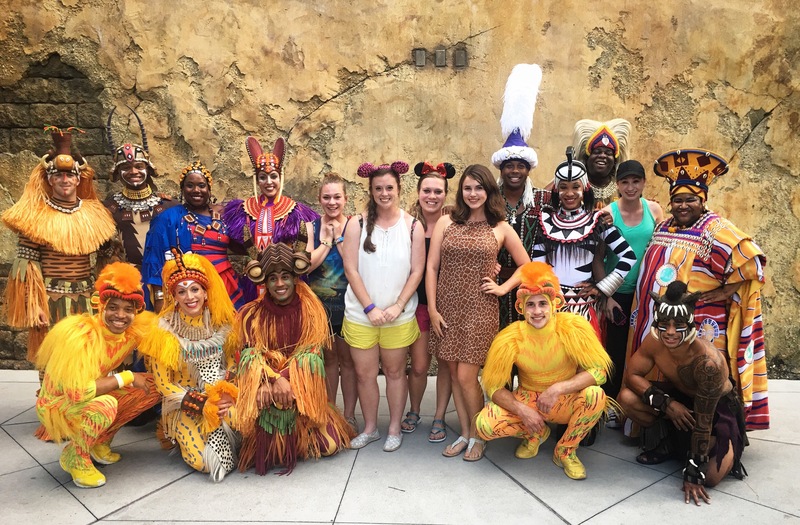 During my college program, the Festival of the Lion King became my absolute favorite show on Walt Disney World property–every time I visited DAK (Disney’s Animal Kingdom…WDW [Walt Disney World…see?!] is obsessed with acronyms), I made sure to stop by the Harambe Theatre and take in all that this glorious festival has to offer. If you haven’t experienced it for yourself yet, I encourage you to do so on your next trip. The Festival of the Lion King is not a show based on plot or story, but rather ambiance inspired by select songs from The Lion King. “Tumble Monkeys” exhibit the fun and laid-back vibe of “Hakuna Matata,” a fierce fire-twirler (is that the right term?) captures the sinister aura of “Be Prepared,” and literal love-birds take the stage to represent the sweet nature of “Can You Feel the Love Tonight.” The more I watched this beautiful show, the more my love for it grew and grew. There was something about the simplicity of it–I didn’t have to keep up with a plot, I only had to sit back and enjoy every intricate piece of the performance. Because I love this show so much, it is no surprise that my favorite memory from my college program is the day I got to experience it in the front row of the lion section. I had seen the show so many times before, but seeing the spectacle from that close was truly incredible. The cast seemed to connect with each one of us. Timon stopped by and a Tumble Monkey played a quick game of duck-duck-goose. Did I mention that I got to be the demonstrator of the lion section? I will forever be unnecessarily proud of that moment; I tried my very best to replicate the roar of the most majestic creature of the animal kingdom. After the show, we were so very lucky to get to meet a few members of the cast. My group of friends was undeniably a little bit of a mess–with only two weeks left of our beloved Disney College Program, we were already beginning to become reluctant to leave the magic behind. We were so overcome with emotion and excitement, we couldn’t stop crying. Ugly crying. Those poor Tumble Monkeys didn’t know how to handle us. I just want to take the time to thank everyone who brings this beautiful show to life. It’s a celebration of life and love and beauty and color and music, and it truly touches so many. I listened to the soundtrack today as I made my way around town doing errands, and my heart couldn’t help but ache for it. I miss you, FOLK, but I know that you will always welcome me with open arms whenever I visit my home. Until I can feast my eyes on FOLK again, I just have to remember to live in the moment on my own “path unwinding,” to celebrate life as joyfully as a mischievous Tumble Monkey, to not be afraid to fight for the spotlight like Timon, to embrace beauty and love as it comes, and to truly appreciate all that the circle of life has to offer. FOLK is not just a show–it is truly a way of life. Hakuna matata, my friends. I hope you have a “wild” day!